Today i will discuss how to Create DBA profile in Huawei OLT. Here i work Huawei MA5608T Model OLT. Type 1: This is fixed bandwidth type and mainly used for services sensitive to delay and high priority like VOIP. Type 2 and Type 3: Both are guaranteed bandwidth types and mainly used for video services and data services of higher priorities. Type 4: This is best-effort type and mainly used for data services such as Internet and services of low priority which do not require high bandwidth. Type 5: This is mixed type, involving all bandwidth types and bearing all services. At first login your Huawei OLT & go to config mode then type bellow command. Please follow below you tube Video for show configuration. Is this issue related to dba profile.. Can you suggest on it. Yes, it is your DBA profile issue. May be your fixed BW of DBA profile is assigned highest BW & this profile occupied full BW, Can you send your all DBA profile list, by putting below command….. Please delete/modify your DBA profile id:4, and reduce it's BW bellow 1Gbps. Then try. All fixed BW are capture this dba id 4. Not enohgh BW are free in fixed BW. thanks for your reply but, I’ven’t use no 4 profile in any of my ont-profile. used profiles are 11 12 14 & 15. Does it make any difference in unused one as well. Please do it & feedback me. That have any problem still exist or not ? when you create Service-port/Add ONT. I have a problem with upload speed, it’s much slower than it should be. Where can be a problem? May be problem of your DBA profile/ Traffic table. If it is OK then check optical loss of physical path, If it is OK then check UTP cable & PC/Laptop Ethernet LAN-card speed 100Mbps & full duplex or not ? I have the same problem as Srijan. I creat a new dba-profile but still give me the same message. Failure: The Bandwindth is not enough. Your problem is same as Srijan. 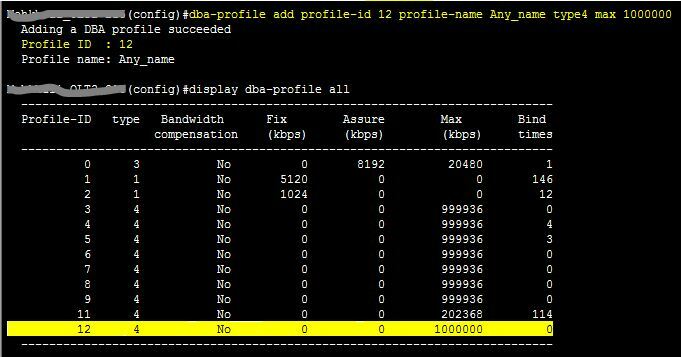 please modify DBA profile ID: 4 & BW assign bellow 1Gbps, You may assign it 10/50/100Mbps. This fixed BW occupied your full BW. so reduce it & try again. Hi Shahid, I have an problem. In Hyuwai OLT i assinged a dba profile of type1 for 50 Mbps speed. But customer is getting speed around 15-18 Mbps downloading and ony 1 Mbps uploading. what could be the problem. Can you mail me your DBA profile & Traffic table list ? Also OLT model. Thank you for the excellent website, could you please explain the need of DBA-Profile if traffic can be controlled by traffic-profile ? How can i configure ONT FE port as trunk Port for many VLANS???? Same problem with dba-profiles, there is the problem in T-CONT assigned dba-profiles with assured bandwidth, so dba-profiles with assured bandwidth in use. There is no possible to modify a DBA in use, how it could be done? maybe power-off al boards? Is there anyway to change it in standby board and save it at all? You can do it by modify DBA profile. If it bind with many ONT, then release first all this DBA profile id from all ONT by change ONT lineprofile. That's ok!! I did first new dba-profiles, then changed ont line-profile (cause I used one generic), then modified dba-profiles. yes, you can do this way.